The Upper Sioux Community is governed by a five-member Board of Trustees, elected to serve staggered four-year- terms. The Board members are responsible for the development, implementation, administration, and evaluation of all tribal programs and services. 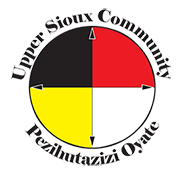 The mission of the Upper Sioux Board of Trustees is to provide culturally-based programs and services that preserve the Dakota traditions, promote and support education, healthy families and a diversified and growing economy, leading to increased self-esteem and self-sufficiency for individual community members and the Upper Sioux Community, Pezihutazizi Oyate.